Updated 17th March: the cast has just been annunced: Mark Anderson (The Book of Mormon, Legally Blonde) stars as Toxie with Hannah Grover/Sarah (Ghost, Evita), Lizzii Hills/Ma Ferd, Mayor and Nun (Chicago, EastEnders), Marc Pickering/White Dude (Sleepy Hollow, Les Miserables) and Ashley Samuels/Black Dude (The Book of Mormon). 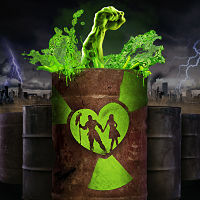 Southwark Playhouse are presenting the European premiere of the monster rock ‘n’ roll musical comedy Toxic Avenger for 5 weeks from 2nd April-21st May. It is by the Tony Award-winning creative team behind Memphis, Joe DiPietro and David Bryan and is based on the 1984 cult classic film from Troma Entertainment. The citizens of Tromaville are crying out for a hero – enter Melvin Ferd the Third, an aspiring earth scientist determined to clean up the toxic waste problem. But when a corrupt Mayor and her government goons try to stop this heroic feat, Melvin is tossed into a vat of toxic waste and transformed into The Toxic Avenger, New Jersey’s first superhero! ‘Toxie’ is a seven-foot mutant freak with superhuman strength and a supersized heart to match. He’s out to save New Jersey, end global warming, woo the prettiest (blindest) librarian in town and get home in time for dinner, in this toxic love story with an environmental twist. Prepare to laugh, scream and sing as ‘Toxie’ rocks the house and saves the day. The show is based on Lloyd Kaufman’s The Toxic Avenger and is being presented by arrangement with Josef Weinberger Limited on behalf of Music Theatre International of New York.